Nanofluidics is the study and application of fluids in and around geometries with nanoscale characteristic dimensions. The field of nanofluidics is not brand-new. Some issues associated with nanoscale fluidics have been occasionally dealt with by researchers in membrane science, colloid science, and chemical engineering for many decades. For example, researchers have explored nanofluidic energy conversion inspired by biology, a nanofluidic power generator on graphene, demonstrated the manipulation of individual water nanodroplets on surfaces, or the engineering of 2D nanofluidic channels for energy storage application. Improvements in nanofabrication methods and the ability to construct well-defined nanofluidic geometries in the recent past have accelerated research in nanofluidics by chemists, biologists, as well as materials scientists and mechanical engineers. Nanofluidics is usually considered to be a realm evolved from microfluidics, but is obviously not just an extension of microfluidics. New physical phenomena and mechanisms which are not observed at microscales or in bulk start to emerge and dominate at nanoscales, opening up a virgin research territory to explore new scientific insights and applications of fluids. 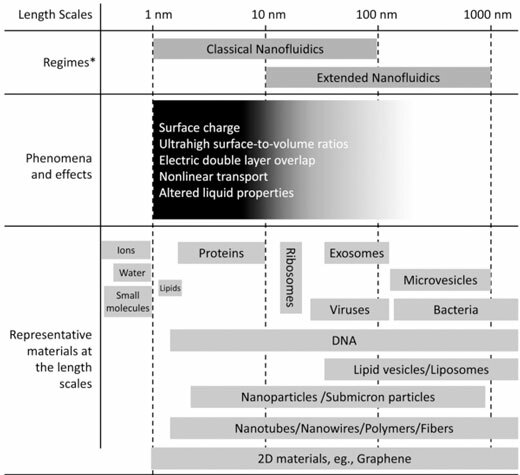 These five directions also form the major sections of Xu’s review article, providing a detailed discussion of materials and processes associated with the nanofluidic devices having well-defined nanochannel structures. 1) Membranes of new materials – such as carbon nanotubes and two-dimensional (2D) materials – can be directly used as nanofluidic devices without using expensive nanolithography technologies and are promising for applications such as separation, water purification, and high-efficient energy harvesting, but nanofluidic devices fabricated on solid-state substrates (such as glass) possess advantages in the ease of integration into a lot of available analytical methodologies and instruments, which would bring innovative devices and applications serving a variety of chemical, biological, and medical purposes. The development of new materials, low-cost nanolithography, and nonlithography technologies allowing the flexible fabrication of large-scale, high-throughput, 3D, solid-state in-plane nanochannels are required to broaden the commercial products and applications of the solid-state nanofluidic devices in the future. 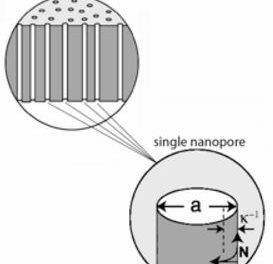 2) Clogging and fouling are critical issues occur in almost all applications of nanofluidics, due to the ultrasmall and closed feature of nanochannels. For fundamental studies on ionic transport in nanochannels, the use of ultrapure water and ultrapure solvents during the experiments as well as careful rinsing and drying after experiments is quite effective to avoid or alleviate clogging and fouling in nanochannels. However, for handling biological and nanoscale materials, clogging and fouling will frequently occur, due to the characteristic lengths of many biological and nanoscale materials are comparable to the dimensions of nanochannels. Clogging and fouling may be alleviated by delicate design of nanochannel structures and coating of channel walls to decrease interactions between these nanomaterials and channel walls as well as nonspecific adsorption of biomolecules. Coating with polymers widely used microfluidics usually bring about severe clogging, so coating with small molecules will be a feasible strategy. Therefore, synthesis of small molecules enabling to modulate surface energy and suppress nonspecific adsorption in nano channels will be important in the future. 3) To reach the goal of single cell omics which is a large-scale task in current biology and medicine, abilities allowing high-throughput manipulation and detection of subcellular entities are required. Nano fluidic devices are promising tools for these purposes due to sub cellular volumes of nanochannels. The development of technologies and materials for fabricating nano-array of functional surfaces or material domains in tiny nanochannels to selectively capture subcellular entities, as well as efficient mechanisms for simultaneously handling a large number of subcellular entities in nanochannels, would be an important direction in the future. 4) If selective manipulating local fluids with ultrasmall volumes in nanochannels is achieved, accurate assembly of nanometric materials (ultimately single molecules) as building blocks in the liquid phase would become possible. This will revolutionarily impact on material fabrication and chemical synthesis in the future.